With the MQC_CUSTOMIZED varitaion, we will fulfil your special wishes. This offer ranges from a light amendment to the standard version up to a complete new system. We would be very happy to work with you to develop an optimal solution which is customised to your specific needs. A new system which enables the capture of data on guest's opinions and feedback has been developed for areas without constant internet connection. Information is input into a minipc (Netbook) or Laptop (windows compatible). The data transfer occurs via internet when connected. 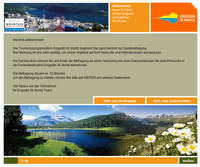 The questionaire was developed especially for events in the Engadin St Moritz region. Viathe existing online platform, new events could be added, information corrected and anaylsis performed. The software can be installed on numerous pcs at any one time. The Quality Check of the ENGADINcard. A short survey which was produced on its own system. The customer obtains a link via a Newsletter direct to the CUSTOMIZED ENGADINcard Check.